Today, the Sesquicentennial of Independence Commemorative Silver Half Dollar Coin remembers when Dr. Price graciously rejected the Continental Congress, 239 years ago. In October 1778, the Continental Congress agreed to offer a position to Dr. Price of London and provide him a home in America. Doctor Price, returns his best thanks to the honorable Benjamin Franklin, Arthur Lee, and John Adams, Esquires, for conveying to him the resolution of congress of the sixth of October last, by which he is invited to become a member of the United States, and to give his assistance in regulating their finances. It is not possible for him to express the sense he has of the honor which this resolution does him, and the satisfaction with which he reflects on the favorable opinion of him, which has occasioned it. But he knows himself not to be sufficiently qualified for giving such assistance, and he is so connected in this country, and also advancing so fast in the evening of life, that he cannot think of a removal. He requests the favor of the honorable commissioners to transmit this reply to congress, with assurances that Doctor Price feels the warmest gratitude for the notice taken of him, and that he looks to the American States as now the hope, and likely soon to become the refuge of mankind. Over several years, Dr. Price gained the attention of the Continental Congress and the people of the rebellious colonies for his published observations on politics and war. His commentary provided understanding of the American viewpoint, however the pamphlets were not received favorably by all of the British government. Richard Price to Arthur Lee. Newington, June 15th, 1777. Dear Sir, — Accept my best thanks for the very kind and obliging letter with which you have favored me. It gave me indeed great pleasure; and I am particularly happy in the approbation you express of my late publication. I have drawn upon myself a torrent of opposition and abuse; but the satisfaction I feel in the consciousness of having endeavored to promote the cause of liberty and justice makes me abundant amends. Having done the little in my power, I have taken my leave of politics; and am now in the situation of a silent spectator waiting with inexpressible anxiety the issue of one of the most important struggles that ever took place among mankind. Your letter has been communicated to the persons you mention at the conclusion of it. They are all well, but now out of town. I know you have a great share of their particular regard. We are much in the dark here; and I am continually longing for some method of coming at truth amidst the numberless stories that are circulated here, and the mutilated accounts given out by the ministry. I should be much more large and explicit in answering your letter, were I not obliged to be very cautious. You will, I doubt not, consider this; and make allowances for me. Under a grateful sense of your kind remembrance of me, and with sentiments of warm and affectionate respect, I am, dear Sir, your very obedient and humble servant. 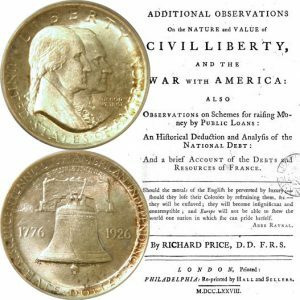 The Sesquicentennial of Independence Commemorative Silver Half Dollar Coin shows with an image of the title page of one of Dr. Price’s pamphlets, circa 1778.